In just three years, Tim Cook has done something truly remarkable at Apple: he’s more than doubled its stock price. 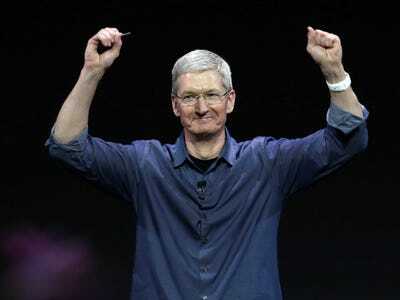 When Cook took over the top job at Apple on August 24, 2011, Steve Jobs’ health was deteriorating. Some doubted that Cook could lead the company as well has Jobs had. And while it may be too early to judge the products Apple has made under Cook, the company’s stock had soared since he became CEO. Last April, Apple announced a 7:1 stock split on its shares. Shareholders received six additional shares for every one they previously held. It hasn’t been a easy ride for Apple’s stock, which took a beating in the second half of 2012 leading into 2013. But investors turned bullish on Apple in recent months, largely because of the iPhone 6 and 6 Plus. 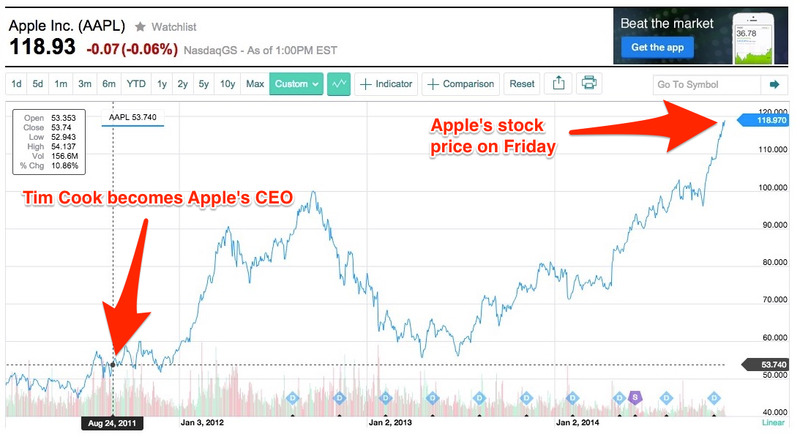 There’s no telling when Apple’s stock will see this kind of growth again. But if Cook can do for the Apple Watch what he’s done for the iPhone, Apple might become a trillion-dollar company not too long from now.